It does not seem possible that we are more than halfway through 2018! We only have a few more weeks of summer and then it’s back to school time! In the process of getting ready for fall, it might be time to begin looking at your flooring needs. There are many interesting trends that have been showing up in the first six months of 2018. While smooth floors are a classic look, the top trends have been all about texture. Whether you prefer wood or vinyl, there are many types of textures that you can use in your home. When it comes to hardwood, there are two main choices—new or reclaimed. Reclaimed comes with texture built in, whereas with new wood, texture can be added with a hand scraped or wire brush look for a distressed finish. If you want texture in other flooring finishes, vinyl is a good place to begin looking. Advancements in technology have made vinyl almost unrecognizable from the linoleum-type rolled goods of the past. 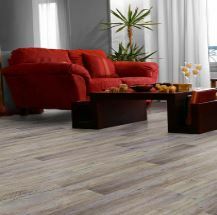 The available textures in vinyl are almost endless, with the various textures making the vinyl look like a wide variety of woods, stone and even things like bamboo. Beyond textures, trends in 2018 have also seen a return of whitewashed finishes and lighter blond wood colors. For a relaxed, ‘beachy’ look to a room, a whitewashed floor is a good base. This can be done in hardwood, engineered wood, laminate or vinyl. To lighten a room and make it seem larger, a blond or light-colored wood can bounce more light, and make things seem more spacious. The light and airy blond look is one of the hottest design trends of 2018 and is becoming even more in demand as the year progresses. No matter what trend you find attractive, come visit our showroom and let our experts show you the trends and help you decide which one is right for your home! We look forward to hearing from you and seeing you when you stop by the showroom at 451 Park Ave in Scotch Plains, New Jersey.